Lithonia Lighting P Series Collection Recessed downlighting features aluminum die-cast reflector for uniform distribution of light. It has one 12.7-Watt 83 CRI 3000K LED lamp to offer 725-Lumens light output. Lamp has voltage rating of 120-Volts, current rating of 0.11-Amp and frequency rating of 50/60-Hz. Lamp has average life of 50000 hours. 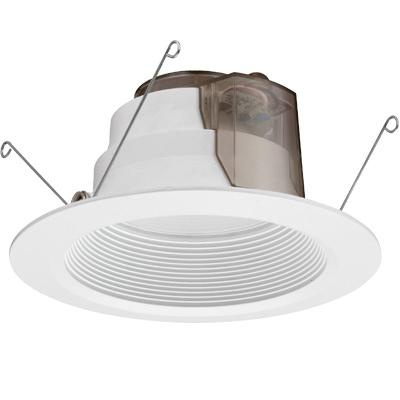 It measures 7-5/8-Inch Dia x 3-7/8-Inch and withstands temperature rating of 46 deg C. Ceiling mountable downlighting is suitable for use in residential spaces such as kitchens and basements and light commercial applications such as boutiques and hotels. Recessed downlighting is CSA certified.